Pratt-Skyline head coach Jon Novotny knew Kiowa-South Barber had a terrific duo with senior quarterback Peyton Yandel and senior running back Dylan Allison. But Novotny believed the Thunderbirds’ strengths, especially their size up front, could trump the Chieftains’ talented backfield. The plan worked and Skyline, an Eight-Man, Division I program, ended a long losing streak against South Barber with a 48-32 road victory. After the game, Novotny, in his ninth season with Skyline, talked about the last time the T-Birds defeated South Barber, a longtime power. It’s believed 1999, Skyline’s last playoff team, was the last time the T-Birds beat the Chieftains. It marked one of several significant statements made at the eight-man level in Week 1. Osborne pulled away to beat Thunder Ridge 52-28. Central Plains defeated Victoria 42-24. Spearville beat Madison 32-28 in the final seconds. Osborne was No. 3 in the Division I preseason poll, Thunder Ridge was No. 1 in Division II poll. Central Plains ranked fourth in Division I, Victoria second in Division II. Spearville was No. 5 in Division I, Madison No. 1 in Division I. South Barber was ranked No. 5 in the Division II preseason poll. Skyline finished with 63 plays, 58 on the ground. South Barber had just 42 snaps. The Chieftains had a slight edge in yards per play (6.9 to 6.8), had 60 fewer penalty yards, and won the turnover battle (plus-1), but Skyline’s 398 rushing yards proved the difference. Quarterback Cole Patterson was Skyline’s lone graduating starter after he threw for 507 yards, rushed for 380 and accounted for 11 scores on a team that averaged 37 points per contest. Now, Skyline doesn’t use a true quarterback, but has seniors Daniel Hacker and Dustin Weber in the backfield. The T-Birds heavily use zone read and Hacker finished with 30 carries for 219 yards and six touchdowns. “I trust either one of those guys on carrying the ball, making the decisions ‘Do I give, do I keep,’ ” Novotny said. Weber, who led the team with 1,412 rushing yards in 2013, collected 23 carries for 146 yards. Hacker is 6-foot and around 230 pounds, while Weber is 6-1, 160. Kenworthy plays center and the Lees start at guard. Novotny said the T-Birds ran traps between the 1-2 gaps on the interior line “all night long.” Lineman Brady McComb, the lone junior at 6-1, 190, is athletic and interchanged at guard and strong tight end. 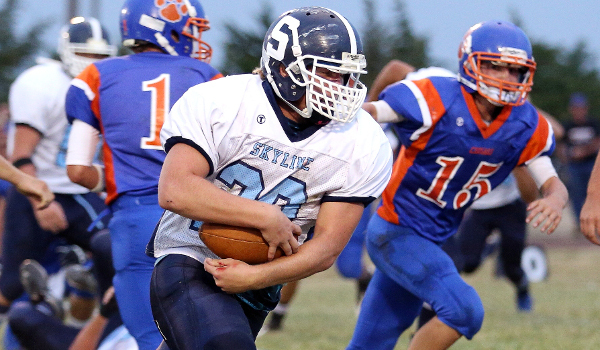 Skyline, like many small schools, has went through cycles in Novotny’s tenure. The T-Birds posted seven, one, zero, three, five, six, zero and five wins in the last eight seasons, but had trouble against the top teams. In addition to the South Barber skid, Skyline had lost seven straight to Macksville before last season. On Friday, Novotny was most pleased with his team’s ability to bounce back and fight. The T-Birds led 20-14 at halftime, stopped South Barber to open the second half, and then went on a 75-yard TD drive. In the fourth quarter, Skyline stopped South Barber on 4th-and-1 at midfield. After South Barber recovered an onside kick, the T-Birds recovered a fumble at the 1-yard line. The victory marked another big road victory; Skyline is 1-3 at home, 5-1 on the road in the last two years. Matt Fowler’s first head coaching job came at Spearville. Last week, Fowler, in his sixth season, reflected on the start of his tenure. The Lancers went 3-6, 1-8 and 0-9 in his first three seasons. At times, Spearville lost close games. Other occasions, the opponent was just better. “You don’t realize how hard it is,” Fowler said. But Fowler was very encouraged by the play of his then-junior high squad. Those players, now juniors, have mainly started since they were freshmen. The group has helped Spearville go 5-4 and 8-2 the last two seasons and pick up a big 32-28 victory against Madison last week. Junior Brandon Davis (team-high 116 rushing yards) scored on a 26-yard run in the final minute. Junior Nathan Stein had 108 rushing yards, 86 passing yards, and led the team with 13 tackles, including an interception. But junior Brady Sherraden, also a returning starter at linebacker, stepped up big. Last Tuesday, Fowler expected Sherraden to miss the first three games because of mono. The next day, Sherraden went to the doctor, retested him and checked his spleen. He was cleared to play. Sherraden finished with 10 tackles, including seven solo, for a new career high. A big question mark for Central Plains was replacing Colton Zink and Evan Liebl, the 1-2 tacklers fro 2013. In addition, Zink was the No. 1 running back and a strong kicker and Liebl was the team leader. Last Friday, Central Plains had strong games behind the all-state combination of quarterback Braedan Crites and wideout Layne Bieberle in a 42-24 victory over Victoria. But Michael Ryan (two sacks) replaced Liebl at center and defensive end and played well. Junior Jacob Warnken, a Hoisington transfer, had a solid game in the backfield and at linebacker in Zink’s stead.